Cover of the Docpoint Festival catalog. This week, I’ve been mostly watching documentaries. 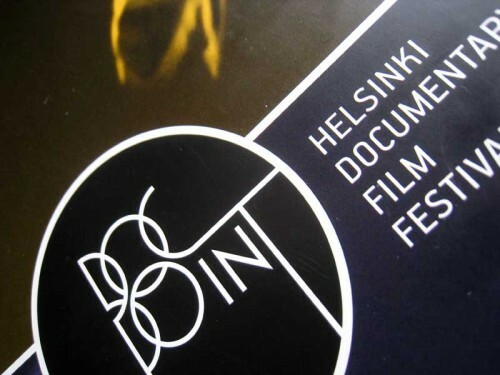 At the Helsinki documentary festival named Docpoint, to be exact. I’ve never been to this particular movie festival before, so I thought this was a good opportunity to be active in a different way. In total I saw four documentaries (I was supposed to see five, but remembered the date of one incorrectly). The first one was Adulthood, a close-up naked observation of a young french woman who works as a stripper and hopes to work as a nurse in the future. Money is limited and life comes with its frustrations, but somehow the documentary failed to make the whole case interesting for me. Towards the end of the presentation I simply lost interest in the whole thing and started admiring the Maxim theatre’s original decor walls instead (these days protected by the National Board of Antiquities). Pity, that. The next day I went to see Sweet Dreams, which told about a group of Rwandan women finding ways to let go of the genocide past by playing drums (typically reserved for men in the country) and even setting up an ice-cream shop, which this documentary is more about. It was an interesting look in how these women can find joy and solidarity together, but also how the scars of the genocide still cause agony and can not be forgotten. During the same evening I also saw Crude: The real price of oil. This was a documentary about an environmental lawsuit in Ecuador against oil company Chervon. The company is accused of polluting the Amazon from numerous oil spills, which the company naturally strongly denies and calls the whole legal case a “extortion scheme”. This was a good documentary that gave a fair opportunity to question even the environmentalists’ true motives. During the weekend I saw Leviathan. This documentary had such a unique approach to the subject – a fishing vessel, its crew and their cold relationship with the ocean – that it could be called more of an art video project. The trailer pretty much gives you a hint would you potentially like it or not. I also had a ticket to The Pervert’s Guide to Ideology, but somehow I remembered the screening date wrong and therefor missed it. I’ll just have to convince myself it wouldn’t have been worth it, which I doubt. All in all, watching documentaries from the big screen was a refreshing change. I’ll consider going to Docpoint next year too. And watch more documentaries in the meantime.